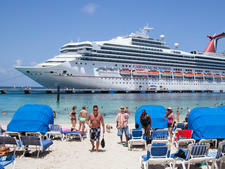 So you want to book a balcony cabin on your next cruise... but you're not sure which one. Looking at the deck plans, you might wonder about the differences between an aft balcony versus a balcony cabin. Forgetting all the upgraded categories (like family balconies or spa balconies), let's take a look at the two main types of balcony cabins and explore what you get with an aft balcony versus a standard balcony room. 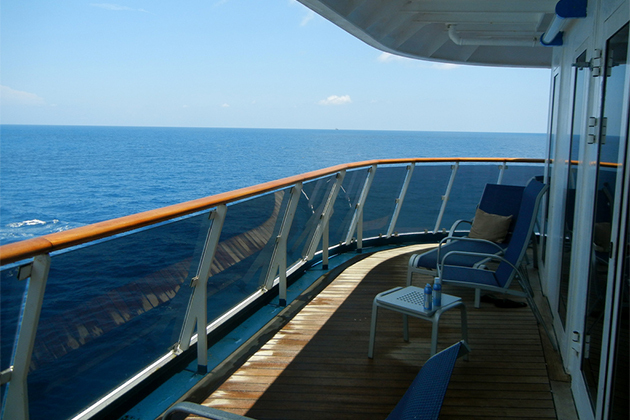 The basics of a balcony cabin are the same, whether your cruise room is located midship or aft. All have twin beds convertible to queen- or king-sized beds, a desk/vanity combo, closets and drawers for storage and some sort of sitting area, either with a chair or sofa. They have ensuite bathrooms, typically shower-only but occasionally with bathtubs. The private balconies are furnished with chairs and small tables for drinks, so passengers can enjoy ocean views and breezes while they read, chat or enjoy a snack. Balcony railings are at least 42 inches high; some balconies are covered (with the balcony or deck above as the roof), while others are stepped out and open to the air (and less private). 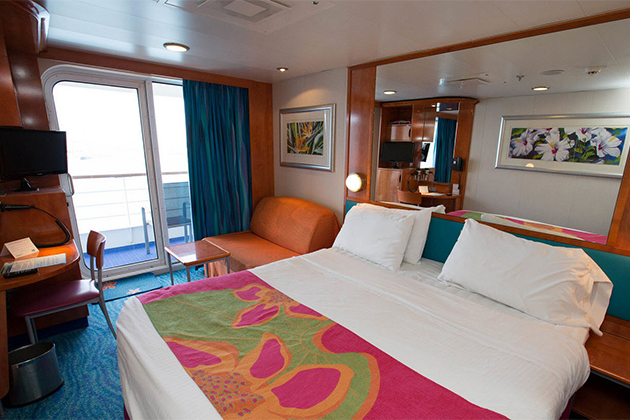 Balcony cabins are popular room choices, especially in warm-weather or scenic-cruising destinations. They are typically priced higher than interior or windowed cabins and cheaper than suites. 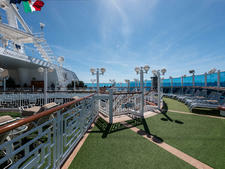 Balcony rooms around the ship can be assigned to special classes, such as spa cabins or concierge-level cabins. The main difference between aft balconies and regular balcony cabins is location; aft balconies are located at the very back of the ship, with only a handful per deck, while regular balcony cabins line both sides of the ship. While individual cabin specs vary by ship, in general, the aft-facing balconies are deeper and sometimes wider than the regular balconies. This means that aft balconies may have extra or upgraded furnishings, such as additional chairs or loungers versus upright chairs. Sometimes the interior portion of the cabin is the same in both categories; other times, aft balcony cabins are larger or irregularly shaped. Some might have support poles inside the rooms. Due to their location, aft balconies can be less breezy and, therefore, hotter than regular balconies as the ship's structure blocks the wind. The view from an aft balcony is of the ship's wake; the view from side balconies is better for viewing the port (and late-returning pier runners). Aft cabins can feel more movement from the ship's thrusters; this is true whether your balcony looks aft or faces to the side at the back end of the ship. Aft balcony rooms are a long walk from elevators and public areas compared to midship cabins, but they're also quieter with limited hallway noise. Compared to standard balcony cabins, aft balconies are often more expensive. On some ships, many of the aft rooms, especially the corner cabins, are suites. 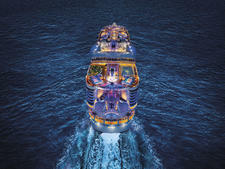 Whether you prefer an aft balcony versus a regular balcony cabin comes down to individual taste. Choose an aft balcony if you have a bit more vacation budget to spend and are looking for a larger verandah with wake views. These cabins are not ideal for travelers with mobility issues or those easily bothered by engine vibration. 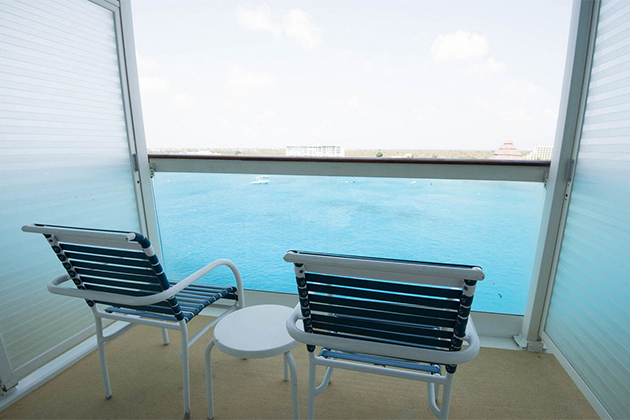 Choose a standard balcony if you're looking for a cruise room with private outdoor space and easy access to fresh air but don't need anything special or fancy. Cruise travelers with mobility issues and who are prone to seasickness should choose a midship balcony for the smoothest ride and minimal walking from the elevator banks.